Accepta’s advanced technology multi-functional boiler water treatment chemicals combine an oxygen scavenger and polymer sludge conditioner with the other necessary chemical components to offer boiler protection in a single “one-shot” chemical product. Accepta’s multi-component boiler water treatment chemicals bring together the convenience of a single chemical treatment product, with multifunctional protection capabilities to deliver superb, all-round boiler protection. This makes them ideal for most industrial boiler and steam raising plant treatment applications where a simplified, single chemical product approach is required. Our multifunctional boiler water chemicals come in a range of high-quality Sulphite and Tannin blends suitable for a wide range of boiler specifications. Accepta 2324 Sulphite Yes Yes Yes Easy to use sulphite based multi-functional liquid for low and medium pressure boilers. Accepta 2319 Tannin High High alkali content tannin & polymer-based liquid. Ideal for low alkalinity waters in low pressure and heritage steam applications. Accepta 2320 Tannin Low Low alkali content tannin & polymer-based liquid. Ideal low pressure and heritage steam applications where there isn’t much requirement for alkalinity building. Multi-functional Boiler Water Chemicals provide the advantage of containing a blend of essential treatments such as an Oxygen Scavenger, Polymer Treatment & Alkalinity Builder to provide a multi-treat solution, this may mean they can be dosed exclusively but in many situations, they may still need to be supplemented by a Phosphate and Amine Treatment. If your application requires treatment with DEHA or Carbohydrazide these can be found on the Oxygen Scavenger category. A Steam Boiler treatment program should always include an oxygen scavenger and polymer treatment. It is typical to also include a phosphate treatment especially in applications above 10 bar (150 psi). While it is always necessary to control the alkalinity, where the makeup water is reliably softened the regular use of an alkalinity builder may not be necessary. When it comes to corrosion prevention in an industrial steam boiler the two main oxygen scavengers in use are Sulphite or Tannin both of which are highly effective inhibitors. However both have distinct advantages over the other in certain situations and applications. Starting with Sodium Sulphite (also expressed as Sulfite), this is recommended for applications where live steam comes into contact with the product. While a good boiler treatment program should not allow for priming or carryover, should this occur a tannin treatment program may spoil or stain where boiler water is carried into the process. This is the same reason for food processing where Sulfite treatment is the FDA approved solution. However, for other applications where steam does not come into contact with the process, Tannin has distinct advantages over Sulphite. 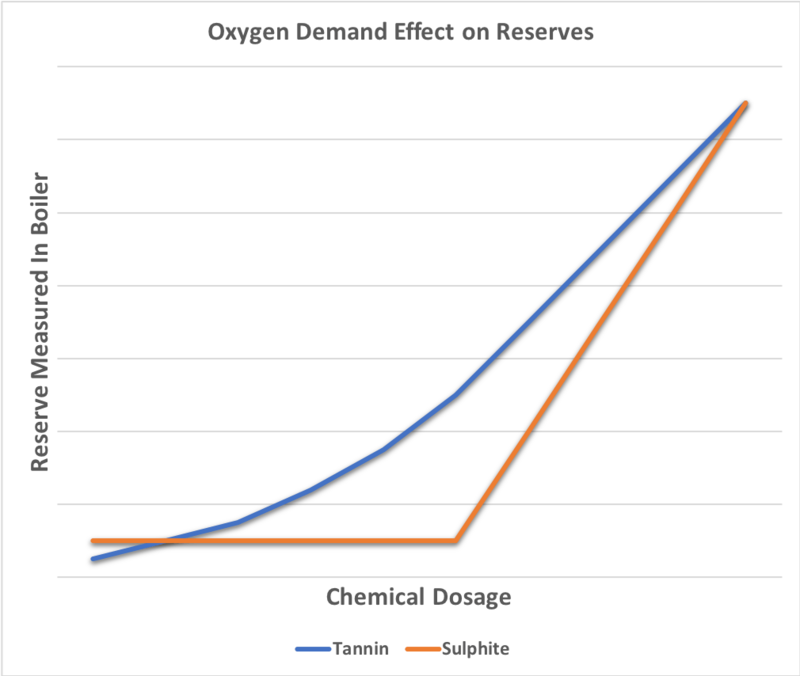 One of the clearest advantages is control, taking a look at the chart it is clear that the Sulfite reserve measured remains flat until the oxygen demand has been overcome. Once the demand is satisfied a reserve is very quick to establish in fact overdosing is all too easy because of this tipping point. With Tannin, chemical reserves are present immediately and build up gradually making treatment simpler. Another major difference between these treatments is the effect on TDS, when dosed into the feed water line Tannin does not add to the dissolved solids in the boiler water, unlike Sodium Sulfite. This reduces the amount of blowdown required to keep the boiler running at recommended TDS, a Sulphite program can increase annual fuel cost by as much as 1.5% over Tannin. Reduced blowdown saves energy and chemical offering a cost advantage over a Sulphite treatment program. Has a dual mechanism to protect industrial boilers from corrosion by producing a corrosion resistant gamma-ferric oxide iron tannate film which covers the metal surfaces. Tannin is recommended for protection of boilers which often sit idle. Protection level can be gauged simply by measuring the colour of the boiler water. Tannin is much more cost effective where feedwater temperatures are low because lower dosages are required. More cost effective where make-up water TDS is lower.